I thought you'd like a sneak peek on a new feature that I just pushed to the master branch. It's a new "MeshStyle" called "DistanceFieldStyle", and its main use is smooth rendering of bitmap fonts of any scale. It also supports some special effects (outline, glow, drop shadow) that are rendered right away, i.e. without detours over filters or render textures! The style requires that you process your textures with a certain "signed distance field" algorithm, but there are several tools available that help with that. Is there any significant performance penalty when using this style (with or without effect - glow, shadow...) for TextFields which have their text value changed often? This looks really great !!! But before I get my hopes high... can we use this in Feathers ?? and yes what about the performance ?? Thank you Daniel, cool implementation! Thanks a lot for the nice words, guys! I still have to make extensive performance tests, but it should come with only a very small penalty, at least given a reasonably capable GPU. And yes, this should work with Feathers, just as well! At least if Josh allows us to access the "style" property (if that's not possible yet, I'm sure it will be easy to add). Maybe I'll also add an additional XML element to the ".FNT"-file in the future, so that Starling recognizes the distance field mode automatically. It's not currently possible to use DistanceFieldStyle with the BitmapFontTextRenderer in Feathers, but I'll make sure that it gets added in the next version. Hi Daniel, this feature will always break batching, right? I didn't test the performance yet, but the draw count is going really high. idk if that will be an issue or not eventually, as this is the first Starling app I'm doing. A quick update on distance field rendering: I just added a new utility to Starling, found in the "util" folder: The "Field Agent". With the help of this tool, you can convert any black and white image into a distance field texture. More information can be found in its README file. In a nutshell, it's a Ruby script (inspired by this article) that wraps some rather elaborate calls to ImageMagick. (Thus, both Ruby and ImageMagick need to be installed.) I tested it on Windows and macOS. I was looking into something very similar at one point. 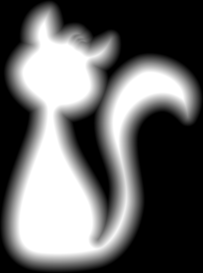 The edge detection method for transparent PNGs did something very similar when looking for an outline of a transparent picture. This should be very much the same, I think. At Starling documentation it's described DistanceFieldStyle that is assigned to cat image and showed a cat picture with shadow. But I cant get such shadow. As a result I'm getting image of circle bordered quad with dark bottom right corner. Could you upload that "quadTexture" somewhere so I could try it out? quadTexture - it's just a white rectange 10x10 px. I'll write more details with links and some illustrations today after work. Hello and sorry. The daily routine consumed my time. So only now i can write you. In reality, this is just a pure white image with an alpha channel (this one), but I put it in front of a black background so you see what's going on. The details about what distance field rendering is about can be found in the Starling Manual. Does that help? If you need any more help, just keep on asking. ok, Daniel, thx. I thought it have something similar to DropShadowFilter. So its clear now about its usage.